Welcome to Glen Ellyn Pediatric Dentistry! Glen Ellyn Pediatric Dentistry, P.C. opened its doors in 1987. After over 25 years, our Glen Ellyn-based practice has grown, but our treatment philosophy remains the same. Dr. Lance Lambert, Dr. Claire Garcia ,Dr. Joyce Koh and Dr. Jaime Chowaniec are committed to providing the highest-quality, personalized dental care in an environment that welcomes children of all ages and abilities. Our office provides comprehensive dental care for children ranging from infants to adolescents, and we see many patients with special health care needs. Since 1987, our focus has been the prevention of dental disease through education and early treatment. 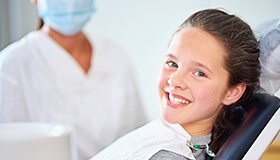 We are committed to providing your child with the best possible dental care in a gentle, warm environment. Following the guidelines of the American Academy of Pediatric Dentistry, we recommend that the first dental visit be at 1 year of age, or within 6 months of the eruption of the first tooth. By examining a child at this very young age, we can provide important information to parents regarding their child's oral hygiene, dietary habits, non-nutritive sucking habits, risk of decay based on family history and other factors, and discuss dental injuries. In addition, we can often identify problems that may present early in the child's dental development. Our goals are to help children grow up with good oral health and to reduce their chances of developing undetected decay and infection. If your child is beginning Kindergarten or transferring to a new school, you will need to fill out an Illinois Dental School Form.